Dave taught his first official survival lesson while serving in the British Army back in 1984; initially trained as a Combat Engineer he also gained extensive training as a Mountain Leader where he led groups of soldiers in numerous countries from Africa to Europe, Central America and the USA. A chance meeting led Dave to start a long apprenticeship with Mors Kochanski where, after twelve years, Mors presented Dave with a certificate acknowledging him as a ‘Wilderness Living skills and Survival instructor.’ Dave states this is the most prized certificate he owns that he has gained for outdoor excellence. His experience gained in dogsledding, and ski joring, led him to compete in the Ski Jor World Championships in Fairbanks, Alaska, in 2001, as a member of the British National Team. 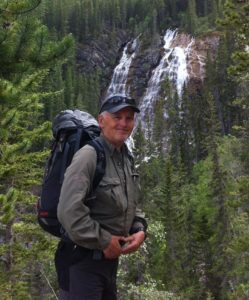 Dave holds various guiding qualifications; with the Wilderness Guides Association (WGA), and the Association of Canadian Mountain Guides (ACMG), as a Hiking and snowshoe guide. He is an Instructor with the Interpretive Guides Association (IGA), the Outdoor Council of Canada (OCC), and with the Canadian Association of Nordic Ski Instructors (CANSI). Plus he is a Wilderness First Aid Instructor with the Canadian Red Cross; and Wilderness Travel and Survival Instructor with Voshaar Outdoors, in Holland. He currently works with his wife’s company ‘Mahikan Trails’ teaching Indigenous skills of the land. Dave’s skills have been used by the world of entertainment where he has worked on several TV productions, and one Walt Disney film; and more recently as a survival consultant on the History Channel’s ‘Alone’ show TV series.